At Ocean Grove Holiday House, you will feel welcome & relaxed in this spacious, fully self contained 4 bedroom Holiday Home. Quality facilities & amenities provided, a real home away from home. The large elevated balcony at the rear provides a distant view of the ocean out from the Rip (Port Phillip Bay entrance). The balcony is the perfect place to relax in a peaceful setting, with a serene view across to the Ocean. You can sit back and WATCH THE SHIPS sailing out to sea through the day, and also at night. There are many large ships coming & going, the occasional Ocean Cruise Liner, and the Spirit of Tasmania Ferry sails out of the Bay twice daily. It’s a magic sight lit up at night. The home and facilities are well suited for 3 Couples or 2 Families as there are 4 Bedrooms with 2 Queens, 1 Double and 1 Single bed. There are 2 Bathrooms and a Powder room. 2 Living area’s with TV’s/DVD’s, and a Table tennis table in the Garage. Its furnished with modern furniture, tasteful decor, and has spacious living and outdoor areas. This all makes it very easy to relax and enjoy your holiday. With 3 split system Air Conditioners, Fans, Gas Heating and a Cosy Gas Log fire, it’s well equipped for both Summer and Winter. 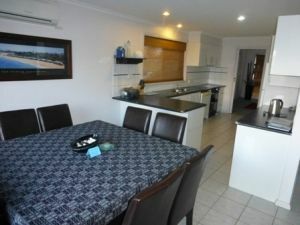 SCHOOLIES & YOUNG GROUPS: As the property is in a quiet street amongst permanent residents, it is not suitable for Schoolies bookings and Young Groups. 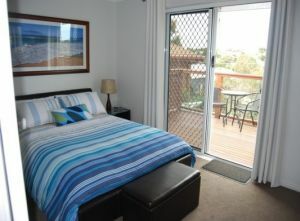 PETS: Ocean Grove Holiday House is a pet free property. Pets are not allowed inside or outside. PARKING: Off street parking in the garage for 1 car and on street parking for 2 cars. LINEN: All beds have good quality bedding and mattress’s for your comfort. Mattress protectors, pillows, large sized doonas with covers supplied. In Summer we provide cool cotton doonas and blankets if needed, and for the cooler months there are Winter Doonas and Electric Blankets on all the beds. Guests normally provide their own sheets, pillow slips & bathroom towels. LINEN HIRE: We can arrange to supply all linen if preferred for a one off fee per bed: Couple $35 or Single $25. Our Linen Hostess will make up your beds ready for your arrival. Main Lounge room – Leather Chaise Lounge, 42″ HD TV, DVD player, Reading lamp (selection of Movies provided). Kitchen – Modern fully equipped, large fridge, microwave, dishwasher, walk in pantry. Belling Multifunction Double Oven with Ceramic Cook top. (Comprehensive range of cooking equipment, just like home). Dining – Large 8 seat square dining table, Gas Log fire, Radio/CD player, books, magazines & board games. Outdoor Entertaining area – Large elevated Balcony, Ocean View Watch the Ships, Gas BBQ & 6 seat outdoor setting. Laundry – Washing machine, dryer, iron & ironing board. 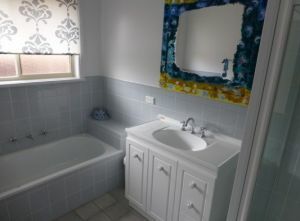 Main Bathroom – Shower, Vanity & Full sized Bath. Bedroom 1 – Queen Bed, Ensuite with Shower, Vanity & Toilet. Outdoor Balcony. Bedroom 2 – Single Bed, spacious room with BIR. Bedroom 3 – Double Bed, with BIR. Bedroom 4 – Queen Bed, Powder room with vanity & toilet. 2nd Living Area – Comfy couch TV / DVD. 2nd Outdoor area – Paved area shaded by the above deck with an outdoor setting, adjoins the back yard lawn area. 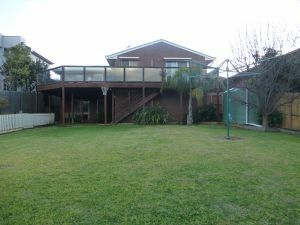 Back Yard – fully fenced, lawn area & basketball ring. Clothes line. Garage – Table tennis table plus undercover parking for 1 car. (There is direct access into the garage from the 2nd Living area). It’s a great holiday house or retreat for couples or families. A clean, very well presented 4 bedroom Holiday Home, with a bright fresh atmosphere and tastefully decorated with a beach theme and modern furniture throughout. It’s elevated at the rear, catching the ocean breeze on the large outdoor balcony with distant views of the Ocean out from the Rip (Port Phillip Bay entrance). The balcony is perfect for alfresco dining so you can enjoy sitting back and relaxing with breakfast, lunch, dinner or a few quiet drinks while you watch the SHIPS coming and going. It’s a very peaceful setting. BEACH THEME: The Beach theme decor throughout the house includes Sea Shells, Fish, Lighthouses and Ships. There are beautiful pictures including local scenes of Point Lonsdale Lighthouse, Queenscliff Pier, Boats and Beach Huts. Also Ken Duncan’s magnificent print ‘Beautiful Day’ featuring Ocean waves rolling onto the sandy beach is mesmerising above the main Queen bed. HEATING & COOLING: The home is well equipped for Summer & Winter with 3 split system Air conditioners 2 in the living areas, 1 in Main Bedroom, 3 portable Fans, 2 Rinnai Gas Heaters, one in the lounge and one downstairs in the 2nd Living/Bedroom area. There is also a Gas Log fire in the family/dining area, so it’s warm and cosy in the winter. ACTIVITIES: The rear yard is fully fenced, has a basketball ring and a lawn area big enough for badminton. 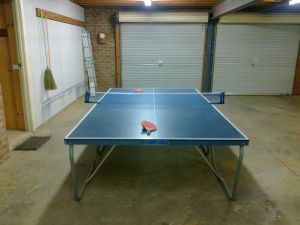 Enjoy a game of Table tennis in the garage, and there is also a community oval just around the corner if you like to kick the footy. The Community area includes tennis courts, a children’s playground, skate park, Gym and the Bellarine Indoor Pool, all within a short stroll from the house. 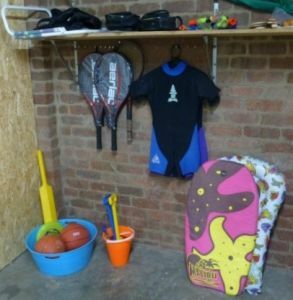 COMPLIMENTARY EXTRAS provided for guest use include: 2 small body boards & wetsuits, sand bucket & spades, cricket bat, tennis racquets, table tennis bats, books, board games and a selection of popular DVD’s. OCEAN GROVE, Victoria, Australia. Is a small seaside town with beautiful ocean scenery, located on the Bellarine Peninsula about 20 minutes drive from Geelong City and 1.5hrs from Melbourne. It’s a very popular Beach holiday destination with its safe surf beaches, variety of water activities, wineries, golf, and many local attractions that promise to delight and entertain visitors to the area. Beautiful Ocean Scenery – Lookouts located at Ocean Grove, Barwon Heads, Point Lonsdale and various locations along the Peninsula. Ocean Grove Beach is a very popular Family Holiday destination (Lifesavers on duty over Summer), Swim, Surf, Windsurfing, Kite flying. Surf lessons available. Barwon River -Sheltered Beach, Boating, Fishing, watch the Pelicans, Landscaped walking paths. Ocean Grove/Barwon Heads boasts a variety of Restaurants, Cafe’s, Clubs & Hotels (Some Award winners in the annual Good Food awards). 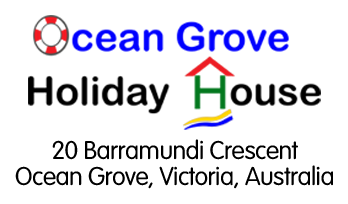 Surfside Community Centre – New Indoor Pool, Gym, Skate Park, Playground, free local Tennis courts. 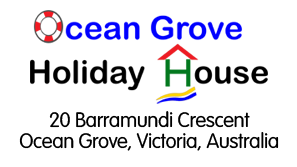 A Variety of Golf Courses suited to the Amateur or Professional. Point Lonsdale Lighthouse, Pier & Rip View Lookout. Queenscliff Ferry operates daily return cruises to Sorrento. Various local Markets operate each weekend. Travel by car for a day trip along the magnificent Great Ocean Road. All local attractions are listed in our comprehensive information folder at the house.